Public areas are equipped with complimentary high-speed wireless Internet access. This 3-star property offers access to a business center and meeting rooms. A bar/lounge is on site where guests can unwind with a drink. Event and conference space facilities measure 2000 sq-feet (180 sq-meters). This business-friendly hotel also offers a fitness center, multilingual staff, and gift shops/newsstands. Hilton Garden Inn San Francisco Airport North is a smoke-free property. 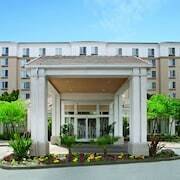 Hilton Garden Inn San Francisco Airport North is 2 minutes by free shuttle from San Francisco International Airport. It’s a 10-minute walk to the BART metro that goes to the city center. Guests can drive 10 miles (16 km) to Union Square, home to luxury brands like Tiffany & Co. and Louis Vuitton. Guests can start the day with a hot breakfast at The Garden Grille® & Bar, which also serves American-style lunches and dinners. 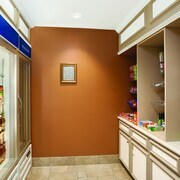 For night owls, the Pavilion Pantry is a 24-hour convenience mart that stocks microwave meals and snacks. 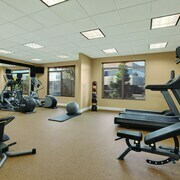 A fitness center is also available . Guests can relax watching premium cable channels on the 32-inch flat-screen TV, and check their flight times using free WiFi. Rooms also have a mini-fridge and microwave. Hilton's signature Garden Sleep System® bedding helps ensure a good night's sleep. Hilton Garden Inn San Francisco Airport North offers 169 air-conditioned accommodations with complimentary weekday newspapers and designer toiletries. Beds feature premium bedding. 32-inch flat-screen televisions come with premium cable channels. Refrigerators and microwaves are provided. Bathrooms include shower/tub combinations and hair dryers. 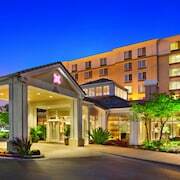 This South San Francisco hotel provides complimentary wired and wireless Internet access. Business-friendly amenities include desks and phones. Additionally, rooms include irons/ironing boards and blackout drapes/curtains. Housekeeping is provided daily. Garden Grill - This restaurant specializes in American cuisine. Guests can enjoy drinks at the bar.